The Qantas lockout: What is it with Leaders of Airlines? With no prior warnings to passengers, the long-running dispute at Qantas erupted into a world-wide lock out over the weekend [Oct 29-30th 2011]. All flights were grounded, leaving many international passengers stranded. As the fury of employees and stranded passengers grew, CEO Alan Joyce defended the need for the action as a response to a protracted industrial dispute with its employees. Hopes for an early return to the air rested with an industrial tribunal hearing at Fair Work Australia (FWA). Richard Woodwood, Vice President of the Australian & International Pilots’ Union, described the decision to lockout all pilots as insane and arrogant. On the surface of things, the [FWA] ruling looks like a humiliation for Qantas CEO Alan Joyce as his airline is ordered back into the skies – having been unilaterally grounded by the airline’s management. But it could in fact be a strategic victory [for Mr Joyce]. Having failed to get the main unions at Qantas (baggage handlers, engineers and pilots) to engage in meaningful talks since a massive restructuring plan was announced in August, Qantas’s warring sides have now been ordered by the FWA tribunal to do exactly that. FWA has in effect locked the company and its unions in until such time as they come up with a long term solution to their awful industrial relations record. 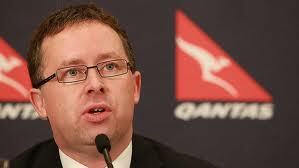 While it may be a strategic victory, it certainly won’t be a financial one for Qantas. Each day that the planes were grounded cost it £13m. That’s on top of the £48m that the strikes since August have cost. But the reputation damage inflicted by this dispute on Qantas could be very profound and way more expensive. The strategic direction of Qantas remains towards East Asia. Its wholly owned subsidiary Jetstar, based in Vietnam and Singapore, is the model for future growth. Jetstar is more profitable per customer than Qantas. In leadership style there are similarities with dramas played out at British Airways which Leaders we deserve posts have tracked. These also involved industrial disputes and confrontation between CEO Willie Walsh and the company’s unions. Commentators have labelled the troubles at BA and Qantas as Legacy difficulties. Older State airlines such as BA and Qantas have been unable to restructure and negotiate with employees in a way that retained competitiveness against younger market entries such as Emirates. ‘Tough’ leadership has tended to be the strategy of choice. Willie Walsh was brought in to BA to apply just such an approach based on his previous track record. The dilemma facing such leaders appears to be one which requires such a leadership style to avert economic ruin from continuing with an uneconomic business model. Incidentally, there are more similarities between the backgrounds of the two leaders, both of whom have Irish roots, and cvs showing links with the Irish airline industry. It takes only a leap of imaginatiuon to presume that Willie Walsh may have been directly or indirectly approached during the head-hunting prior to the appointment of AlanJoyce. According to game theory, the leaders of Qantas and of its employee unions seem to be locked in, not out, to a mutual destruction strategy. Leadership theorists point to the dangers of such ‘either-or’ thinking, and by implication the need for more creative behaviours. This entry was posted on Monday, October 31st, 2011 at 4:10 am and is filed under Uncategorized. You can follow any responses to this entry through the RSS 2.0 feed. You can leave a response, or trackback from your own site. 2 Responses to The Qantas lockout: What is it with Leaders of Airlines? I agree. Legacy carriers like BA/Qantas/Air India are stuck with many labour issues. I wonder if their employees are able to step out of their companies and look at others in the industry and come to realise that their very survival depends on their airline restructuring inorder to survive. The airline industry needs to get more young people to join – by creating good training and prospects : similar to what the financial industry has done. Then the dependence on the older employees ( who are the ones stuck in legacy demands) will have to change themselves when they see they can be put out. The industry needs to invest in itself to bring more talent into it, only then will legacy issue dissipate.